I never thought that Facebook would make amateur photography this cool. Before the great discovery of Facebook, the only one thing that I remember doing after taking snaps was storing them on hard disks of my desktop. Sure, I did upload a few pictures onto hi5. 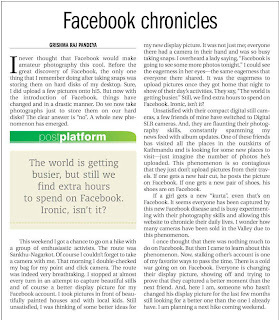 But now with the introduction of Facebook, things have changed and in a drastic manner. Do we now take photographs just to store them on our hard disks? The clear answer is “no”. A whole new phenomenon has emerged. This weekend I got a chance to go on a hike with a group of enthusiastic activists. The route was Sankhu-Nagarkot. Of course I couldn’t forget to take a camera with me. That morning I double-checked my bag for my point and click camera. The route was indeed very breathtaking. I stopped at almost every turn in an attempt to capture beautiful stills and of course a better display picture for my Facebook account. I took pictures in front of beautifully painted houses and with local kids. Still unsatisfied, I was thinking of some better ideas for my new display picture. It was not just me; everyone there had a camera in their hand and was so busy taking snaps. I overheard a lady saying, “Facebook is going to see some more photos tonight.” I could see the eagerness in her eyes—the same eagerness that everyone there shared. It was the eagerness to upload pictures once they got home that night to show of their day’s activities. They say, “The world is getting busier.” Still, we find extra hours to spend on Facebook. Ironic, isn’t it? that they just don’t upload pictures from their travels. If one gets a new hair cut, he posts the picture on Facebook. If one gets a new pair of shoes, his shoes are on Facebook. If a girl gets a new “kurta”, even that’s on Facebook. 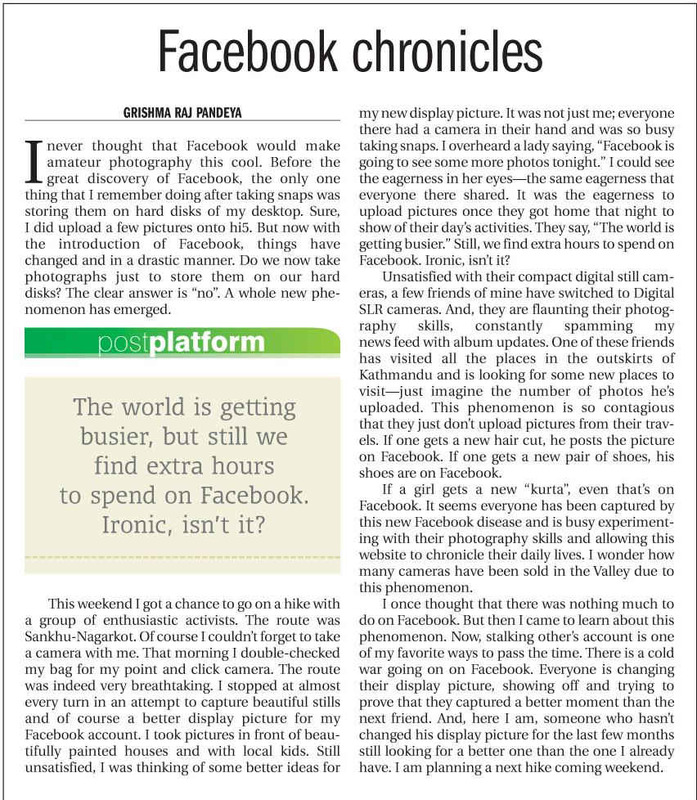 It seems everyone has been captured by this new Facebook disease and is busy experimenting with their photography skills and allowing this website to chronicle their daily lives. I wonder how many cameras have been sold in the Valley due to this phenomenon. I once thought that there was nothing much to do on Facebook. But then I came to learn about this phenomenon. Now, stalking other’s account is one of my favorite ways to pass the time. There is a cold war going on on Facebook. Everyone is changing their display picture, showing off and trying to prove that they captured a better moment than the next friend. And, here I am, someone who hasn’t changed his display picture for the last few months still looking for a better one than the one I already have. I am planning a next hike coming weekend. Click here for e-paper view.